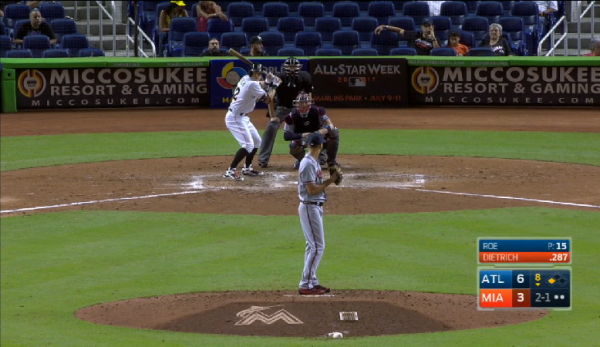 That someone else is Marlins multi-positioner Derek Dietrich. Dietrich hits left-handed, is largely deployed against righties, and has shown himself to be an above-average hitter in his chances to date. His .251/.338/.422 (11o wRC+) career line is indicative of an average hitter with slightly above-average power. 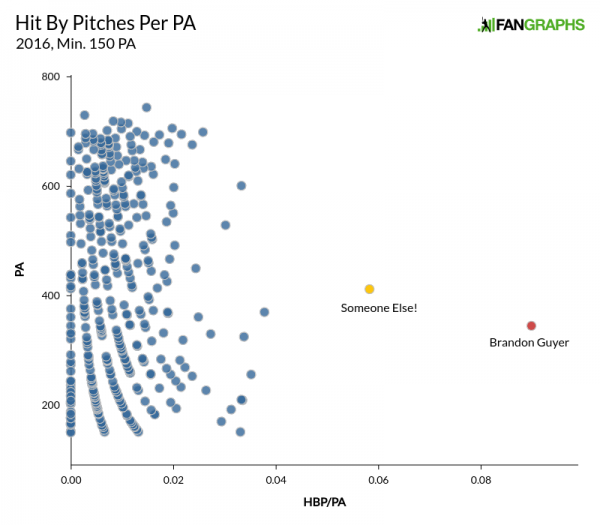 Dietrich is exactly the kind of player most people wouldn’t notice. He’s a platoon player on a lower-profile team and doesn’t seem to possess exceptional abilities within any of the primary tools. But like Guyer, he appears to have some sort of preternatural gift for being struck with the baseball. Before we explore the skill in greater depth, let’s establish its importance. In 2016, Dietrich had a walk rate of 7.8%, which is 0.4 points below league average. However, he had a BB+HBP% of 13.6%, which is 4.5 points above league average. His career marks are 7.1% BB and 11.9% BB+HBP. Put another way, roughly 0.23% of pitches in recent years have hit a batter. Dietrich has been hit by 1.26% of all pitches he’s seen. This is evident if you’re looking at his OBP or wRC+, but if you’re scanning his line to see what kind of player he is, looking at only his walk rate misses something essentially about his game. This isn’t a parlor trick, it has a significant impact on the game. I’m not sure where the average hitter stands, so it’s possible he’s closer to the plate than the generic batter, but there is nothing unusual going on here. He wears a small pad on his right elbow, but he’s not geared up either. 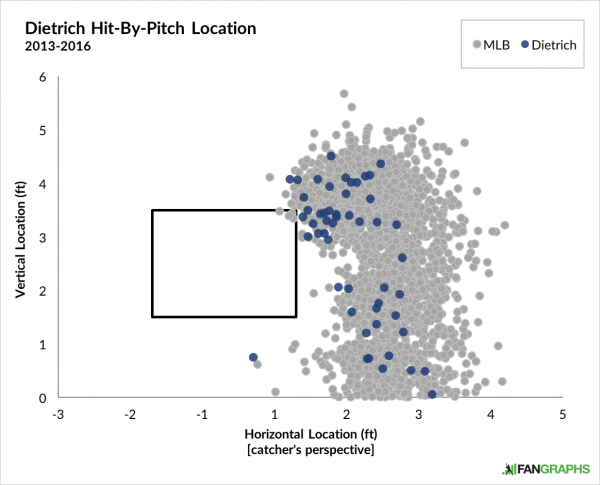 If you look at the hit-by-pitch chart for lefties since 2013, the shape of Dietrich’s data doesn’t stand out as unusual. So what’s his secret? Dietrich hardly makes any attempt to get out of the way when a pitch is heading toward him. A few of his HBP last year would have nailed anyone, but there are a lot of instances in which he could easily have avoided being hit. Here are some examples from 2016. Based on my review of the entire collection, it’s not that Dietrich is a particularly inviting target, it’s that he hangs in exceptionally long when a projectile is approaching. There are instances in which he leans in, but in a lot of the cases he’s simply not bailing out. It stands to reason that this talent probably helps Dietrich in other ways. It seems plausible that this might help him handle the inside pitch, perhaps even breaking balls from left-handed pitches. Given that he rarely gets the chance to face lefties, this theory could be entirely wrong or the Marlins have failed to piece it together. Of course, there could be other reasons why Dietrich might not be a good match for lefties, but the fact that he hangs in so long on inside pitches would seem to suggest that he could make up for a slight delay in finding the ball out of a lefty’s hand. Regardless of whether this finding says anything about Dietrich’s potential to develop into an option against lefties, it says plenty about his value in his current role. Even though it’s a relatively passive act, being hit by pitches is clearly a repeatable skill. Having this kind of talent also forces pitchers to respond accordingly, likely by keeping the ball over the plate more often. If they do, Dietrich gets good pitches to hit. If they don’t, he’ll take the free base. What is perhaps most interesting about Dietrich is that he doesn’t appear to be doing anything that impressive, which means one of two things. Either the skill is relatively imperceptible and his brain is exceptional, even for a baseball player, or a lot of players are missing out on reaching base because they’re not attempting to hang in there an extra fraction of a second. Of course, despite Dietrich’s impressive run, he’s still playing Rafa Nadal to Guyer’s Roger Federer. He may be the second greatest HBP artist of his era — perhaps ever — but he is unlucky enough to have to share the stage with the only man who can outdo him. Thankfully, the offseason is long and the internet ink never runs dry, leaving us plenty of time to appreciate the beauty of Derek Dietrich slowly frustrating National League pitchers with his unwillingness to move out of the way. 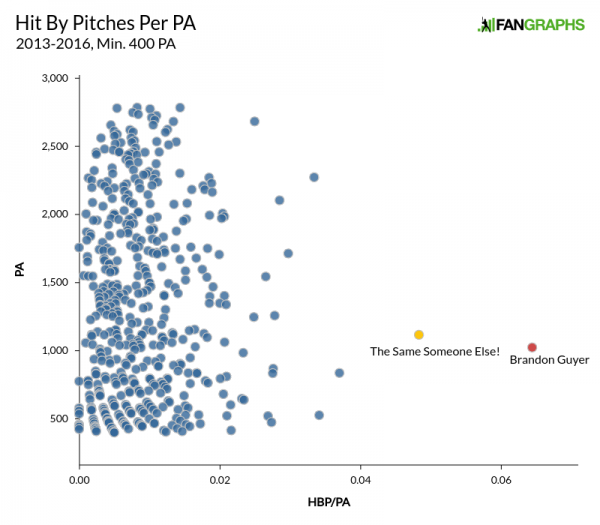 We hoped you liked reading The Other Hit-by-Pitch Savant of 2016 by Neil Weinberg!